In its original form, this Berlin flat didn’t really give an impression of openness or spaciousness. Although the flat is spread over the entire top floor of its building, with the main room connected to a light-filled gallery, the rooms exuded a feeling of being nested and closed. 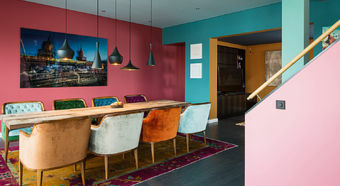 To give the flat the desired character of a spacious loft, the architects removed a wall and integrated a dimly lit chamber into the kitchen and gallery rooms. 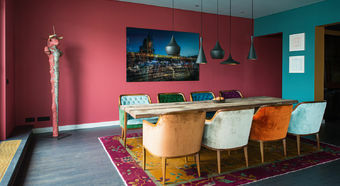 The desired visual interconnection of the various spaces has been achieved with a sophisticated colour scheme, which serves to restructure and highlight individual aspects of the rooms. 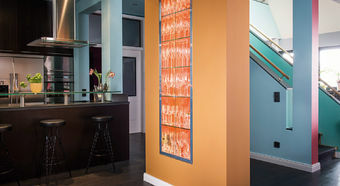 Colour creates more than just atmosphere; it also has a significant impact on perceptions of proportions. 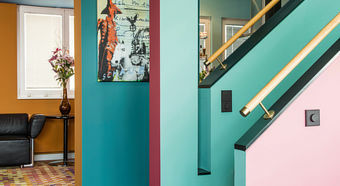 Successfully designing a room’s colour to achieve a desired effect is a complex task. When several shades come into play, it becomes all that more difficult. 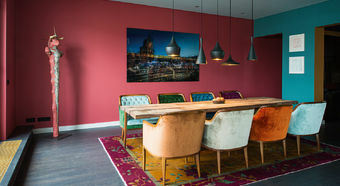 Perhaps only very few people truly have an intuitive understanding of colour, yet the colour concept of this Berlin penthouse is a rare example of perfection. 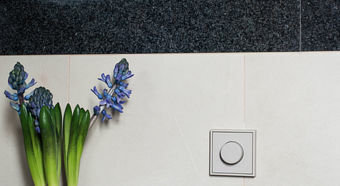 The colour tones range from gentle nuances to striking contrasts. 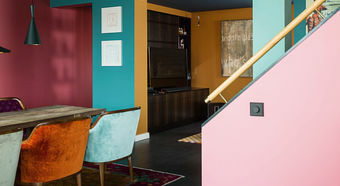 Calmer and slightly saturated hues were used in the bedrooms, whereas the front rooms received coatings of extremely bold, bright and fresh colours. The architects carefully considered each individual space and how they sat in relation to their surroundings. In this way, they were able to highlight the unique and respective character of each room. The electrical installation also adheres to this concept by using JUNG’s classic range of LS 990 switches in the Les Couleurs® Le Corbusier. 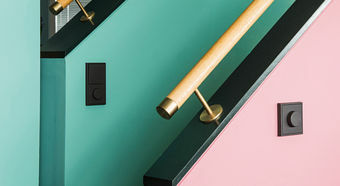 Since 2014 and as a worldwide exclusive, JUNG has offered their classic range of switches in the 63 unique matte Les Couleurs® Le Corbusier, an innovation that has already garnered a special mention by the 2015 German Design Awards as well as took home the title of ‘best of the best’ in the ‘product’ category of the 2014 Iconic Awards. 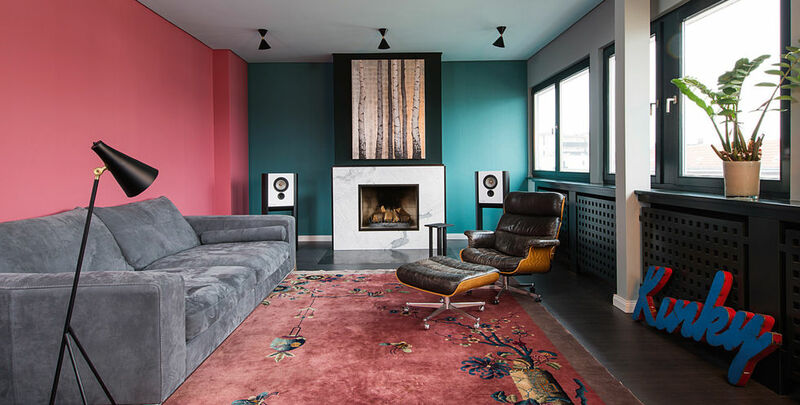 One special feature of the 63 Les Couleurs® Le Corbusier is that each colour can be combined with any other colour in the range. Harmonically matched, the colours play together like orchestral protagonists, sometimes entrancing with their combined performance, while at other times offering an delighting solo performance. The result of the transformation is nothing short of amazing. 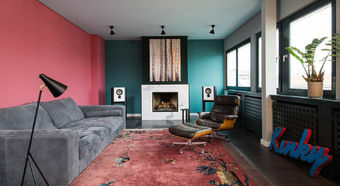 Thanks to its open, yet individually differentiated spaces defined by colour, this Berlin penthouse now offers a comfortable residence with plenty of room for guests. 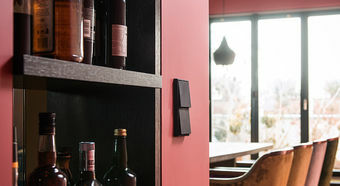 Rotary dimmer Perfect light atmosphere in the versatile JUNG switch design. 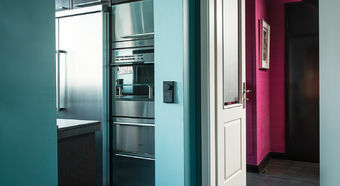 The rotary dimmer dims all LED, retrofit and compact fluorescent lamps as well as HV halogen lamps – recommended by the German Stiftung Warentest consumer organisation (test 10/2013) – smoothly and without any disturbing side effects. 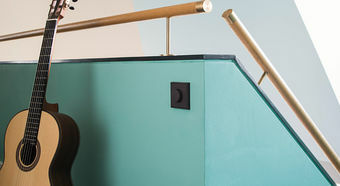 LS 990 in Les Couleurs® Le Corbusier Exclusively throughout the world, JUNG is offering its classic LS 990 switch range in all 63 Les Couleurs® Le Corbusier colours. 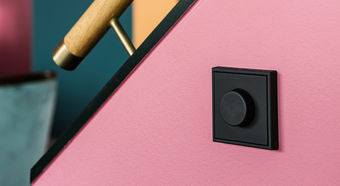 To illustrate the impressive depth of this colour range, the switches are hand-painted using a special process. This produces a matt surface.